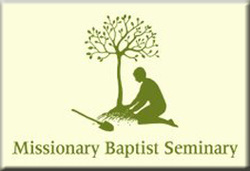 Missionary Training Ministry is a cooperative ministry with the Missionary Baptist Seminary of Little Rock, Arkansas. This ministry will provide education and practical training in biblical church planting principles, methods, and strategies. The courses will further develop leadership and cross-cultural communication skills. The best available resources with proven teachers and leaders in their respective fields will be utilized. An ASSOCIATE OF MISSIONS DEGREE will be awarded to those who complete all MTM and WORLD MISSIONS SEMINAR sessions and the required assignments. MISSIONARY TRAINING MINISTRY will provide modular sessions at the OZARK FOLK CENTER in Mountain View, Arkansas and/or the MISSIONARY BAPTIST SEMINARY in Little Rock, AR. Each particular session will focus on specific, practical areas of training for missionaries. MTM functions as a ministry of practical training, not theological education. MTM exists to complement and cooperate with established seminaries, institutes and ministries, not to compete with them. MTM is a ministry of Flatwoods Missionary Baptist Church and Missionary Joe Morell of Mountain View, Arkansas, in cooperation with Faith Missionary Baptist Church, North Little Rock, Arkansas, the World Missions Seminar and Missionaries Lynn and Brenda Raburn, Missionary Baptist Seminary and Antioch Missionary Baptist Church of Little Rock, Arkansas. MTM is a comprehensive missionary training program designed for missionaries, pastors, sending churches and anyone with a heart for missions. MTM also encourages church members interested in short-term mission projects and trips to participate in the sessions. MISSIONARY TRAINING MINISTRY curriculum is designed to prepare and train both stateside and foreign missionaries. MTM offers practical training in the following areas.